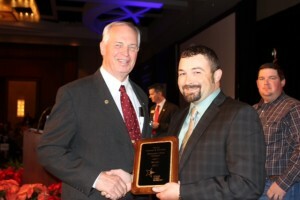 SAN ANTONIO, Texas--Dane Elliott, a Live Oak County farmer, won the 2013 Texas Farm Bureau (TFB) Discussion Meet during the 80th TFB Annual Meeting. The winner was announced during the meeting's general session Dec. 8 at the San Antonio Marriott Rivercenter. In addition to farming and ranching, Elliott owns a small trucking company. He also serves as the president of Live Oak County Farm Bureau, was a member of the Young Farmer and Rancher Board of Directors and a member of the AgLead IX program. He and his wife, Tara, have one son, Kaleb. TFB's Discussion Meet encourages problem solving through cooperative discussion among young farmers and ranchers. Four contest finalists discussed how Farm Bureau can help young farmers and ranchers work with elected and appointed officials on regulations during the final round of competition. Elliott will receive $5,000 courtesy of Farm Credit, $1,000 service voucher courtesy of Chevrolet, a plaque and an all-expense paid trip to compete at the American Farm Bureau Federation (AFBF) Discussion Meet during the AFBF Annual Meeting in San Antonio in January. The Discussion Meet finalists were Cody Archie of Coryell County, Zach Eder of Wharton County and Colin Chopelas of San Patricio County. The three finalists will receive a $200 power tool courtesy of Grainger, a pair of boots courtesy of Justin Brands, Inc., and a plaque. Live Oak County farmer Dane Elliott was the winner of the 2013 Texas Farm Bureau Discussion Meet contest.